In a comment on my recent post about Greek science, I was asked why it took fifteen hundred years for the Christian West to catch up with the ancient Greeks. It's a good question. Firstly, a quibble. We had definitively overtaken the Greeks in natural philosophy by about 1350. That's a thousand years, not fifteen hundred, after Christianity became the official religion of the Roman Empire and could reasonably have become dominant enough in philosophy to make a difference. I have to answer the substantive question of why it took so long in two parts. The reasons why Western Europe took a thousand years to catch up are explained in the first chaper of my book God's Philosophers which you can read online. It was essentially because the Roman Empire was overrun by waves barbarian invaders and all knowledge of the ancient Greek language was lost. It took a long time to rebuild. More puzzling is what went wrong in the Eastern Byzantine Empire where Roman rule went on until 1453 and the final fall of Constantinople. The history of Byzantine science is not a well-developed subject and I for one simply don't know enough to answer this question for the moment. What we do know is that John Philoponus, a Byzantine Christian from Alexandria, was the most important natural philosopher of late antiquity. But after him, there is very little more science. I certainly hope to investigate this question more closely and when I have some better answers I'll report back. Daniel Finkelstein has been on the Judith Rich Harris again. His latest article quite rightly takes politicians to task for assuming that parenting skills have the slightest effect on the way children turn out. As I've argued many times, they don't. However, Finkelstein seems to believe that environment must have some effect. He casts around and comes across Rich Harris's thesis. She claims that it is our peer group that forms us. This is almost certainly rubbish too. Peers have no more effect than parents. The key to the confusion of both Finkelstein and Rich Harris is that they fail to distinguish between innate characteristics and learnt behavior. Some examples of characteristics are intelligence, extroversion, shyness, propensity to addiction, laziness, mathematical ability and optimism. You get the idea and can probably add many more. Behaviour includes language, reading and writing (although how good you are is largely a characteristic) and mathematical knowledge. Now it is true that you can learn from both parents and peers. It may also be true that you are more likely to learn from your peers than your parents. But Rich Harris is wrong to extend the ability of peers beyond imparting behavior to also shaping our innate characteristics. They can't. Environment (aside from diet) as almost no effect on them at all. By assuming we can change people by changing their peer group, I fear Finkelstein will send us off on a wild goose chase as pointless as the nurture assumption. Could the Greeks Really Do Science? Asking whether the ancient Greeks were any good at science might seem a silly question. After all, the conventional wisdom is that the Greeks invented science. But look a little more closely, and the Greek achievement is not quite as spectacular as it appears. Ask someone to name a scientific theory developed and proved by the Greeks and you may not get much of an answer. Actually, there were a few genuine Greek scientific discoveries. Most important is Archimedes law of displacement and the work on statics that goes under his name. For instance, he knew how to calculate the mechanical advantage gained from a lever. Aristarchus of Samos famously suggested that earth goes around the sun, but the idea did not catch on. Eratosthenes’s measurement of the circumference of the earth is often brought up as a scientific achievement although he neither proposed a theory nor tested a hypothesis. I suppose you should say that proving the earth is a sphere is truly a scientific discovery, especially as early Greek natural philosophers doubted it. Now the bad news. Greek medicine, both in general and in almost every specific was conceptually wrong and useless in practice. Greek astronomy and cosmology got almost nothing theoretically correct at all beyond the earth being a sphere and the light from the moon being a reflection from the sun. The basic principles of Greek kinematics and mechanics were erroneous and as a result everything derived from them was also false. Greek chemistry was devoid of any truth whatsoever and although many different atomic theories were suggested they never raised themselves to the status of a hypothesis. The ‘scientific method’ did not exist and the Greek alternative of ‘demonstration’ was incapable of generating natural knowledge. None of this was the fault of the Greeks. The problem lay in the reasons they had for doing science. Almost none of the Greeks, certainly not Aristotle, did science for its own sake. They had no conception that discovering the way the world worked could be a good in itself. Rather, all science was at the service of philosophy and all theories about nature were intended to provide ballast for ethics. While medicine was practical, it was based on a holistic concept of man rather than the workings of the physical body. So, no. The Greeks were not too hot when it came to science. And their mistakes took an extremely long time to shake off. Where they did excel was in the field of mathematics. There was a good reason for this. Greek thinkers considered the pure realm of numbers to be far superior to the tawdry material world. Thus, they devoted all their attention to it. It took Christianity and its belief in divinely-fashioned nature to re-orientate scientific attention towards reality. Back in 1974, the economist Richard Easterlin did some work on happiness. He gathered research from different countries asking people how contented they were and then compared the results to each country’s GDP per head. He found, somewhat to his surprise, that money can’t buy you happiness. Beyond a certain level, increased wealth made no difference to how content people were. This became known as Easterlin paradox and has become one of the standard weapons with which to critique capitalism. Our absolute wealth did not seem to make us happy and being poorer than the neighbours made us miserable. A new Mercedes gave no joy if the Joneses next door had a Maserati. This idea has been developed further by left-wing thinkers to explain, for reasons beyond natural justice, why economic inequality is a bad idea. Reducing the gap between the rich and poor would actually cheer the country up. Oliver James, a pop-psychologist, took the idea to extremes in his book Affluenza, but being a psychologist of the old school didn’t bother supply any evidence. Now it turns out that Easterlin paradox is an illusion based on poor data. 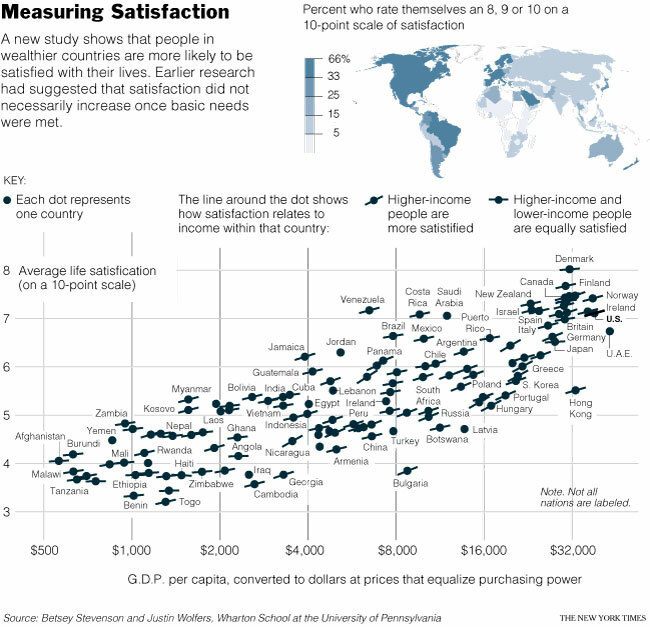 A much larger survey have revealed a reasonably clear correlation between GDP per head and general happiness. It appears that money does make us feel better. I have to admit that, despite being a conservative, I was disappointed to hear this. I liked the Easterlin paradox. It was the sort of counter-intuitive conclusion that I find intellectually satisfying. Secondly, it seemed good that money was not all it was cracked up to be. Still, there is hope. Although the Easterlin paradox may be no more, no one is saying that money is all you need for happiness. Family, friendship and intellectual enjoyment are as important as ever. And, if we are honest, the idea that economic growth is not a good thing is dangerous because it amounts to keeping people poor. Hopefully not even Oliver James will be daft enough to suggest that now. Are Atheists Cleverer than Theists? Professor Richard Lynn thinks atheists are brighter than the Godly. We’ve heard this sort of thing before, most especially that scientists tend to be less religious than non-scientists. This has always left me feeling a little confused as to how I became a Christian studying for a physics degree. Maybe I’m not a real scientist as my PhD is in an arts subject. Dr Giles Fraser thinks Lynn’s argument is a front for racism. Fraser, sadly, has yet to recover the credibility he squandered when he claimed Mel Gibson’s movie Apocalypto was really about the Jews. Still, with Lynn he might have a point, as he is on record saying that black people are less clever that whites. But I think Lynn might have a point (on religion rather than race). It seems to me that your average atheist is of above-average intelligence. He reads books by Dawkins and Sagan that do require a bit more in the way of brain cells than the football pages of the tabloid newspapers. Likewise, he is likely to have a reasonable education. All of which only goes to prove the adage “A little learning is a dangerous thing.” For while I’m willing to concede that atheists may be brighter than the norm, they think they are a tribe of geniuses, which patently they are not. And, as Christopher Howse has pointed out, a few years ago many of our brightest academics were paid-up Marxists. Not the best of precedents, you might think. If anyone remembers the Darwin Wars, they will recall that one of the skirmishes centred around spandrels. These are triangular areas between arches, most obviously on the base of the dome of a church as a result of the way that the vaulting interacts with the columns holding it up. They make good places to put frescos or mosaics. Stephen Jay Gould argued that spandrels are by-products of the way churches are constructed. No one builds a church with the intention that it should contain spandrels, but when you have them you find they are useful display spaces. Gould believed (correctly in my view) that evolution also throws up by-products of the body’s architecture that, once they have appeared, could be subject to natural selection. However, their actual appearance is essentially random. Gould went on to argue (less convincingly, in my view) that this means if you re-run evolutionary history, you would most likely get a very different result to the variety that we see today. The randomness of the spandrels would defeat the non-randomness of adaptation and give us another pattern of life to the one we see today. Among the most vocal of opponents to Gould’s views were Richard Dawkins and Daniel Dennett (the latter in chapter ten of his brilliant Darwin’s Dangerous Idea). Which makes their views about religion really very odd. Both of them have decided (in The God Delusion and Breaking the Spell) that religion actually is a spandrel. They believe it is a by-product (and an undesirable one at that) of useful evolutionary traits. Other atheists with access to the media are peddling the same idea. Their arguments are pretty weak because no one seems to be able to agree about which evolutionary traits religion is a spandrel of. But is it possible for it to be a spandrel at all? Probably not. The essence of their criticism of Gould was that traits can only start off as spandrels. As soon as they exist, evolution can start acting on them. Only a trait that had absolutely no effect at all on an organism’s reproductive chances can be a true spandrel. Everyone agrees that religion has had a pretty big effect on the course of human history, so evolution must have had plenty of opportunity to act on it. And that being the case, it must be an adaptation or else evolution would have got rid of it. So, religion at its earliest stage could well have been a by-product. But once it started to have an effect on human behaviour, it became a trait in its own right. That being the case, it is almost certainly a beneficial adaptation. The New Guinea highlands were long thought to be an inaccessible and uninhabitable wilderness. Then, in the 1940s and 1950s, over-flying planes revealed that the highlands contained a patchwork of valleys full of farms and villages. Anthropologists learnt that the native people were Neolithic farmers who may have been one of the few peoples to have independently invented agriculture. each valley contained a tribe, ruled by its elders and engaged in some trade with the neighbours. It sounds quite idyllic, the noble savages of imagination, but this would be an illusion. The civilisation was blighted by endemic warfare. Because it was impossible to keep an army in the field for long, wars of conquest were out of the question. Nobody could annex the next-door valley, let alone found an Empire. Thus violence was restricted to low-level raiding and minor skirmishes year in and year out. These conflicts burnt up resources, not least human capital, and helped ensure that New Guinea highland society had not developed in the millennia since it was founded. The pattern is repeated all over the world. The Mayans used to be the poster boys for peace-loving mezzo-Americans. Sadly, as Jared Diamond documents at many point in his book Collapse, it turns out they were constantly engaged in attacking the neighbours and making off with enemies for execution and sacrifice. In short, Thomas Hobbes was right. It is a romantic but false notion that human beings can live in small communes living in peaceful association with other small communes. Thousands of years of bitter experience show that we can’t. I have previously suggested that religion is one of the major reasons that humans have been willing to gather themselves into larger groups, with the commensurate reduction in the level of everyday violence they encounter. This could be one of the reasons that natural selection has favoured religious behaviour in humans. It is, as atheists still can't quite accept, unlikely to be a by-product of another trait. I have been enjoying an excellent new magazine called Standpoint. It has an intellectual but conservative stance, seeking to promote ‘western’ values. Needless to say, moral relativists are up in arms. The magazine is a monthly and sees itself as a centre-right rival to the liberal Prospect. New magazines don’t always last long, so it would be nice if this one keeps going. Interesting articles in Issue One include Michael Burleigh on anti-terrorism strategy, Jonathan Bate on academic bureaucracy and Alasdair Palmer of the damaging secrecy of the family courts. Everything seems to be available on-line, although I bought a copy so that I can read it on the train. The articles are long enough that trying to scan them on screen is an uncomfortable experience. Do check out Standpoint if you have a moment. Almost everyone agrees that social mobility is a good thing. People of talent must be able to exercise their gifts and not be held back by stigma or social convention. In practice, this means that many intelligent people born to working class families should have the opportunity to forge what, for what of a better term, we could call middle class careers. Upwards social mobility is, at heart, individuals moving from the working classes to the middle classes. Not long ago, everyone seemed to accept this. Many working class families were delighted when their children, including some close friends of mine, joined accountancy firms or became investment bankers. Now, we are told that this mobility has become less common under Labour than it was under the Conservatives. Why? John Harris, a member of the suicidal left (so called because they think the best way to combat the rise of the Conservative Party is to sidle up closer to Marx) thinks it is all a conspiracy. Oxford and Cambridge deny places to poor kids due to networks of privilege and patronage. That’s rubbish, of course. On the contrary, I think the left much shoulder much of the blame. Reading the Guardian, there seems to be nothing the left likes more than denigrating the middle classes. They are blamed for taking up the best school places, clogging up the health service and causing pollution with their people carriers. In short, the middle class are to be despised and feared in equal measure. But if, as it must be, upwards mobility is to become a member of the middle classes, it is hardly surprising that fewer working people have the aspirations to join them. Bettering yourself becomes akin to switching sides to the enemy. The way to encourage aspiration is to tell young people that ambition, wealth and prestige are good things that they should want for themselves. Telling them instead that it is wicked to be a banker or lawyer is like telling them they should know their place and leave being middle class to the toffs.